Every week, along with the usual reading practise, numeracy tasks and games, the children bring home a school library book to share with their family. This choice is left to the children, from a selection, and so often some pretty odd books can be sent home, but it is all there to foster a love of reading, so fair enough. A lot of four year olds will unfortunately not had very much exposure to books and reading before school, and so simply holding and enjoying a book is an important first step to literacy. As I have worked both in public libraries and book sales, I know how hard it can be to find books that are acceptable to the reasonably aware adult, but usually the most horrifyingly un PC can be weeded out. 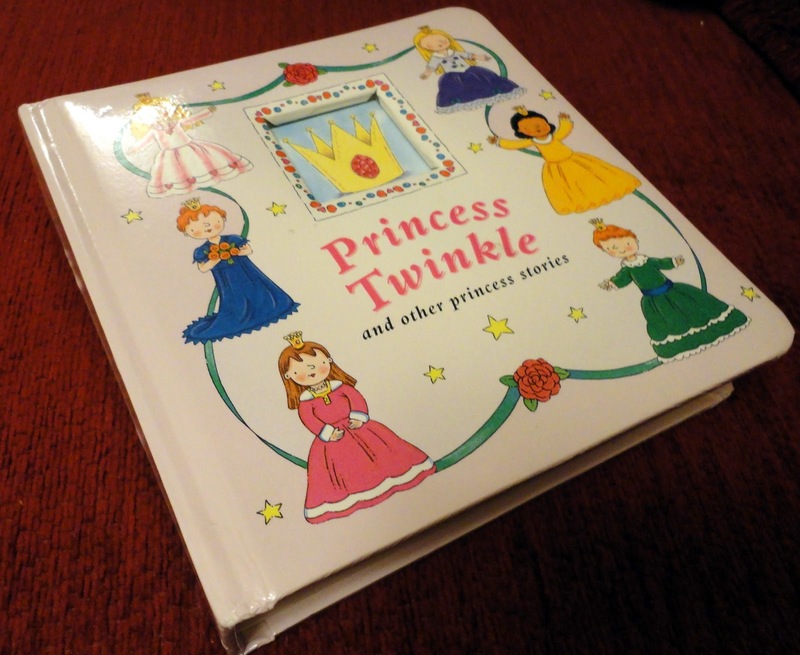 So, when my daughter showed me her latest school library book – “Princess Twinkle and Other Princess Stories” – I cringed a bit, but settled down to read it with her. She had chosen it herself, and while most of the book was far from what I would want my daughter to read, I trusted that it couldn’t get too bad. “The Perfect Princess” features Princess Poppy. She is introduced as a very messy little girl, and pictured climbing a tree in jeans and a t shirt. She does have long loose hair, a crown and appears to be wearing lipstick, but is overall dressed like a normal little girl. Wonderful, I thought – this must be the story where all the stereotypes that have made up the rest of the book are challenged. Poppy is then pictured at the breakfast table, as her parents tell her there is to be a garden party. Poppy asks to be able to wear her jeans, but her mother refuses, saying she has to look like a “proper princess” and be “pretty”. So, up to now I am thinking this is the story where the princess shows everyone that is more important to have fun than dress up. Maybe there will be an amusing incident where a “pretty” princess rips her dress, but doesn’t care, because Poppy has shown her how to have fun climbing trees or whatever. 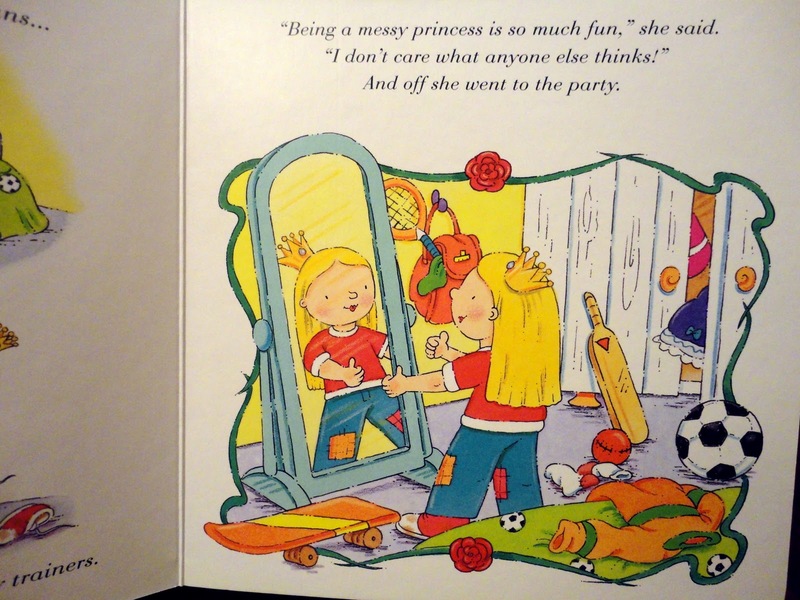 Poppy is then shown getting ready for the party, putting on her t shirt, jeans and trainers, then giving herself the thumbs up in her mirror, saying she doesn’t care what people think, because being a messy princess is more fun. As she stands in front of the mirror, her posture is strong, she is smiling at herself and she is surrounded by her sports equipment. She looks confident and happy. This story could go well. Here is where the story gets worrying. As Poppy leaves the palace to go to the garden party, she spots Prince Harry. As soon as she sees Harry, she decides that she doesn’t want to be a messy princess any more, and runs back inside. So now my four year old is being told that a confident, beautiful girl, in clothes that make her comfortable and allow her to play football and go skateboarding, is not suitable to be at a party with a boy. Polly goes back to her room, and changes into a frilly dress and high heeled shoes. When she returns, Harry is enchanted, calls her beautiful, kisses her hand and invites her for a game of croquet. The children are pictured surrounded by love hearts. So, here is the reward for changing how she dresses- she gets the guy. We don’t know if she changes how she behaves, beyond a picture of her playing croquet nicely on a lawn instead of climbing a tree. The most important thing about Poppy is how she dresses. The rest of the book was bad enough, but this story was so blatant it shocked me. Children of this age are highly impressionable -they are learning so fast that everything becomes a learning experience. They are discovering where they fit in the world, what is expected of them, what to aim for. Poppy was there to show my daughter that she should forget about playing active sports, having fun, being her own person, and should focus on getting herself a nice man. Worse still, the way to get this man is to change everything about yourself, and that is a good thing. Messy is bad. Fun is bad. Pretty and sweet is good. It worries me to think that this book was published in 2003, and nobody anywhere in the publishing and purchasing process thought to change it. I’m hoping that it has found it’s way into the school library by accident, because otherwise I despair. Sadly, I suspect that the school is simply too short on funds to be able to pick and choose what books are availiable. 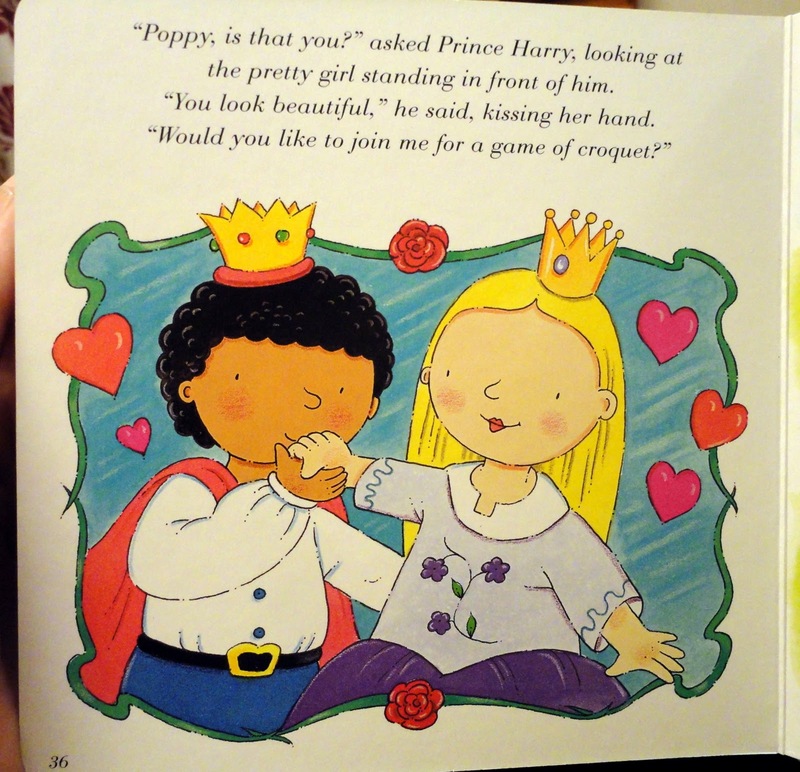 There are so many good children’s books out there, many of which challenge the princess stereotype without being boring or preachy. For example, the excellent Zog by Julia Donaldson and Axel Scheffler, or Princess Smartypants by Babette Cole. These books are a pleasure to hold and to read, with gorgeous illustrations and entertaining text – why submit children to rubbish, especially when they are at such a vital age?